Thank you madam Chair – and let me start by thanking the Government of Norway for your vision and commitment in hosting this ground-breaking Conference on the Humanitarian Impact of Nuclear Weapons. And I want to thank the 132 governments here and eminent speakers from international organisations and civil society for taking our humanitarian concerns about nuclear weapons seriously, and sharing your knowledge, facts, experience and ideas. At the civil society forum this past weekend, ICAN brought together 500 people from over 70 countries – scientists, doctors, mayors, members of parliaments, artists, cultural and religious leaders, experts and activists. 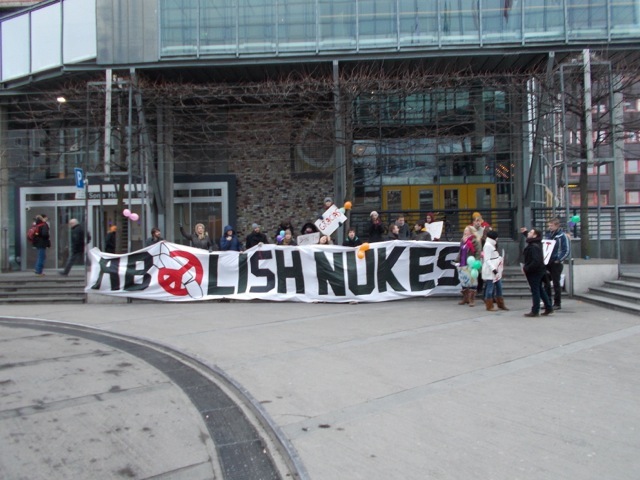 Best of all – as you can see here (and in the demos outside) – the humanitarian approach is involving and exciting the next generation in this growing global campaign to eradicate nuclear weapons. So that they don’t have to live as my generation did, in existential fear of nuclear war – so that they don’t have to bring their children into a world where these nuclear weapons of terror are still produced, deployed, stockpiled and transported around the world, with the ever present risks of nuclear use and accidents. ICAN refuses to be anaesthetised by all the technical and institutional barriers that impede the total elimination of nuclear arsenals – and here let me pay especial tribute to ICAN Norway for their imagination, courage, hard work and the wonderful energy, diversity, outreach and commitment – These young people are the future, and it’s good to see governments responding! 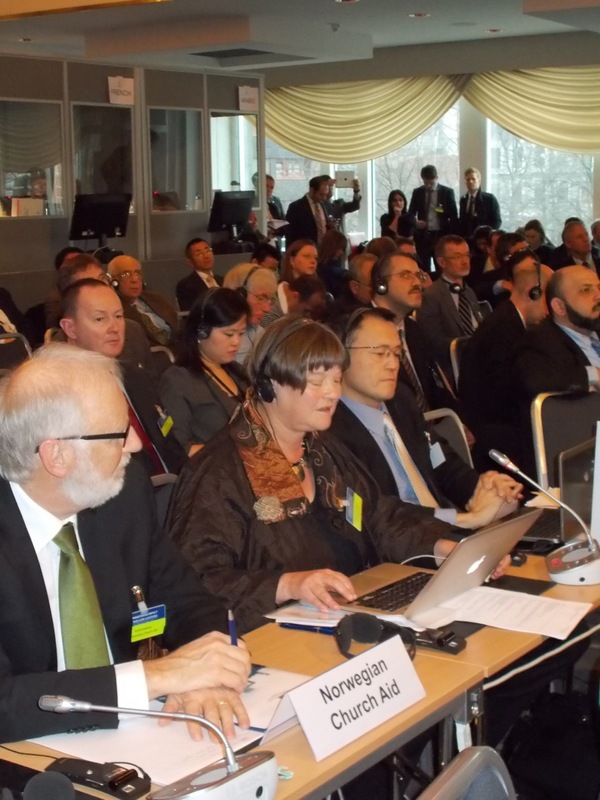 In these two conferences we’ve had to face some appalling realities about nuclear weapons. When the Red Cross, UN and other major aid agencies tell us they would not be able to provide meaningful assistance in the event of nuclear catastrophe, we have to understand what this means. We have a chance to act now, because if the bombs are detonated it will be too late. The consequences would be global, long term and truly catastrophic for human health, our environment, our development, security, human rights and food resources, with the most vulnerable people and regions suffering the greatest harm. This makes nuclear weapons a threat that has to be prevented by everyone. This is not just something that can be left to the states that wield these weapons, as they seem to be in denial. As governments, you are responsible for the safety and security of your citizens. Many countries have taken important steps to make your regions into nuclear-weapon free zones. But if one or more of the nuclear-armed states makes a mistake or gets it wrong, people in all our countries could suffer terrible consequences, wherever we live. Please do not ignore the doctor’s advice. In that spirit, we strongly applaud Mexico’s decision to host a further meeting to deepen understanding of the humanitarian requirements and address what needs to be done. Of course we hope that all the nuclear-armed states will have the courage next time to join in this collective endeavour to make the world safe from nuclear weapons. But even if they prove unready, we do need to move forward now, as protecting all people’s security and our fragile planetary environment must be a vital national security interest as well as international security priority. The catastrophic humanitarian consequences make it an imperative to prevent any nuclear use or accidental detonation. The most effective guarantee against nuclear weapons use and accidents is to ban and eliminate nuclear weapons. It is an anomaly in international law that nuclear weapons are the only remaining weapons of mass destruction not subject to an explicit treaty prohibition. History shows that legal prohibitions generally precede and facilitate the processes of stockpile elimination, not the other way around. And history and experience also show that weapons that have been outlawed become delegitimised. They lose their political status, and so do not keep having money and resources invested in their production, modernisation, proliferation and perpetuation. When you leave here, please continue to think deeply and constructively about what is possible, necessary and achievable to prevent further unacceptable humanitarian harm from these weapons of mass suffering. Together we will make this world free of nuclear weapons. And together we look forward to Mexico.